Viv and I love spicy food. Generally, the spicier the better, unless it is Szechuan Boiling Beef that is on nuclear hot (my experience with that at the now closed Hot Luck was not fun... It was hotter coming out than in!). However, this love for spice has not translated with the kids as they consider pepper to be too spicy. So our mission is to condition their palates with different foods that offer up some heat. 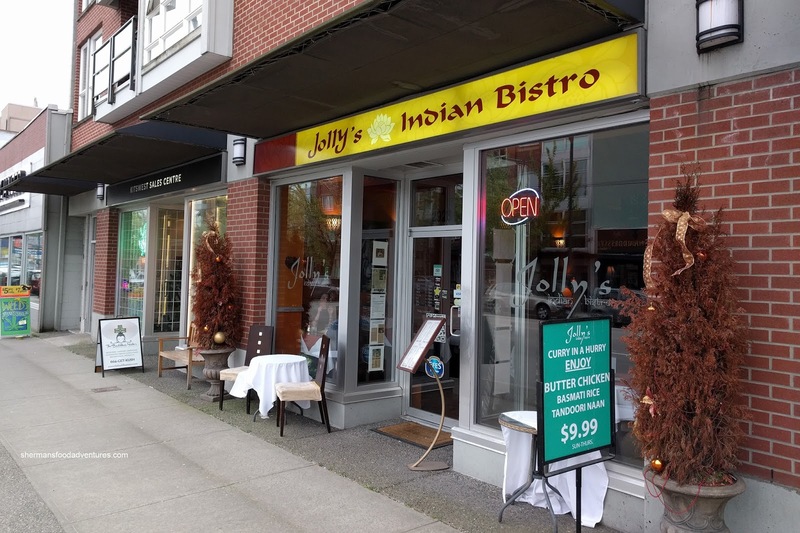 We ended up at Jolly's Indian Bistro for some of this conditioning and also the fact we had a Groupon. Starting things off, we got the Paneer Pakora drizzled with mango sauce. 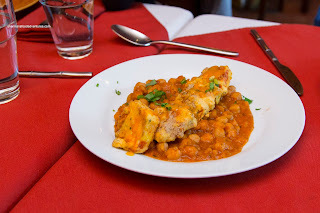 This was pretty good as my son even liked it (sans mango sauce... imagine trying to scrap that off!). Inside, the paneer was soft yet still retained a bite and rebound texture. It was coated with a thin, crispy and seasoned batter (the caraway seeds were dominant). My daughter loved the sweetness of the mango sauce unlike my son. 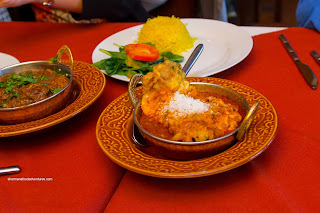 However, the best part was the chickpeas underneath as they were texturally on point while the curry was slightly spicy and aromatic. 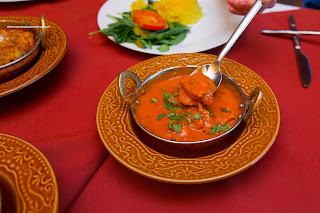 Trying to ease them in slowly, we got them the veritable Butter Chicken. Although it was still decently spicy for mild, the kids still ate it with only a bit of complaining. We found it to be a good balance between creamy and tangy tomatoey while not being overly salty. 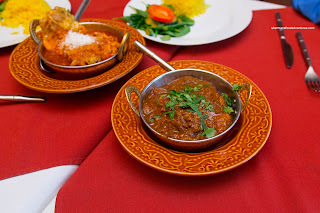 For myself, I had to get the Lamb Rogenjosh and I requested it to be spicy. It did exhibit some heat, but it wasn't mind-blowing. This was fine by me as I could still taste the layers of flavour from the sweetness of the caramelized onions and various spices including the cloves. The only thing I would've liked to see was less salt. The chunks of lamb were of a good size and fairly tender. Lastly, we had the Goan Fish Fry which featured a whole fillet of fried basa advertised as sitting in a chicken gravy. This was fairly mild with a background spiciness. It didn't particularly taste like a chicken gravy as it was more like a curry with coconut. The fish was good though being flaky with a crispy batter. All of these dishes were priced above $15.00, but to be fair, all of them included salad, rice and Naan. 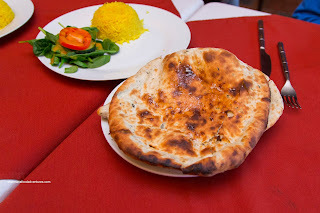 As you can see in the picture, the naan looked more like a well-charred lavash. It ate somewhat like one as well with an airiness to it with a glutenous chew. We also liked the slightly crisp and nutty exterior. So in the end, we were quite pleased the kids ate the food without asking for McD's instead. Overall, it was pretty decent albeit a touch salty. 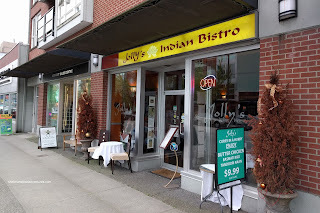 Although I could get better Indian food for less in Surrey, this was not bad for kits.